Music aficionados know who they are: They were the first all-female rock band to release an album on a major record label and the first to hit the Billboard album chart … long before The Runaways, The Go-Go’s and The Bangles. The group — featuring original members Nickey Barclay (keyboards), Alice de Buhr (drums) and sisters June (guitar) and Jean Millington (bass) — recorded five albums (including their groundbreaking self-titled debut on Reprise), scored four chart singles, endured a few lineup changes and eventually disbanded in 1975. “While I (worked) at A&M,” de Buhr told P&P in a 2001 interview, “I worked The Go-Go’s, as part of my job at the retail level. All of the girls knew about Fanny, and told me that if it hadn’t been for us, they’d have never imagined picking up instruments and forming an all-girl band. I listen to the Fanny albums now and then, and some of the music can stand the test of time. 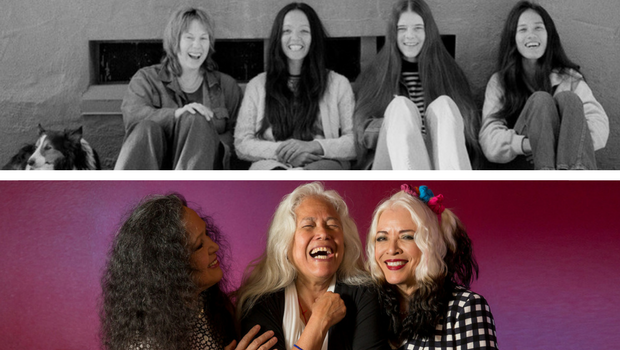 The members of Fanny are also among this year’s Women’s International Music Network (the WiMN) 2018 She Rocks Awards honorees, which pays tribute to women in the music industry. The She Rocks Awards ceremony will be held Jan. 26 at the House of Blues in Anaheim. Better still, three members of Fanny – the Millingtons and drummer Brie Darling – are back as Fanny Walked the Earth, and their self-titled debut album for Blue Élan Records is out March 2. Let’s – as they used to say – “get behind Fanny” and look back at their career. They were basically garage rockers, with plenty of poppiness and power chords, so it was an interesting choice to have Richard Perry produce their first record. They certainly had the musicianship to back it up. “Dance, ooh, stand, ooh / Move to charity ball.” The title track was their first Top 40 single and stayed on the Hot 100 for 10 weeks. Interesting fact: The album cover was photographed by actress Candice Bergen. For its fourth album, the band went with Todd Rundgren at the boards; at that point, Richard Perry was busy with Ringo Starr, Carly Simon, Nilsson and others. Rundgren agreed to produce the album on one condition: that he would oversee the album mix without the band’s input. Fanny went through many changes before its fifth and final album came out. An exhausted June Millington left the band, as did de Buhr. Enter new members guitarist Patti Quatro (sister of Suzi Quatro) and drummer Brie Brandt (Darling). They departed Reprise, signed with Casablanca and went with in-house label producer Vini Poncia. The album, though criticized for Poncia’s uneven production, had solid songs and musicianship, and surprisingly, the band got its biggest hit, “Butter Boy.” Just as the song was peaking at No. 29, the group had essentially disbanded.